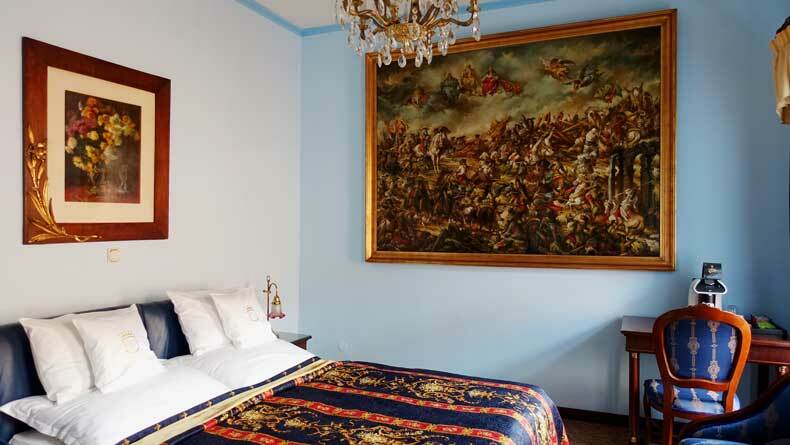 In the heart of Prague, Czech Republic, just footsteps away from a couple of men peeing, you’ll find a small, luxurious hotel made even more fabulous by the staff. We stayed at Hotel U Pava during a now exhaustively written about road trip across Europe. 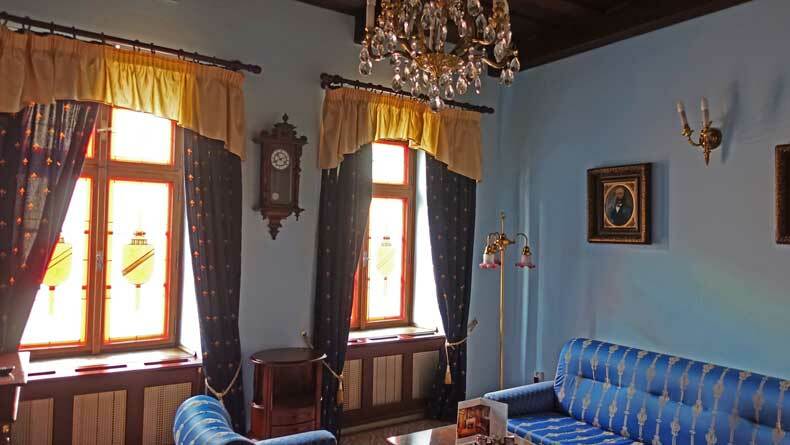 If you are wondering where to stay in Prague, Czech Republic, this hotel is charming, conveniently located, and goes above and beyond for its guests. The attention to detail and vintage finishes inside the boutique hotel added character that you won’t find in a chain hotel. And the location can’t be beat. It’s just a 3 minute walk to the Charles Bridge. It’s 5 minutes from the Lennon Wall, and a lovely 15 minute walk from the Astronomical Clock. But when I think back on our stay at the hotel, I do not recall the wonderful decor or the ideal location as much as I remember the staff. Each morning, we had breakfast at the hotel, which was included in our stay. We were traveling with our toddler, so we had a temperamental 18-month-old with us. While I’m sure her presence mildly annoyed some of the guests, the staff didn’t mind. In fact, it seemed quite the opposite. Each morning, as I was enjoying a delicious cup of coffee and trying to entertain my squirmy child, one of the women who worked in the hotel would stop by. She always smiled, spoke directly to our daughter, and brought pastries, cookies, and packaged goodies to our table. The first day this felt like a random, nice gesture, but by day three, I realized this wasn’t a one time act of kindness. It was a hotel staff that truly cared about their guests. They went out of their way to make us feel welcome. Those snacks, I should mention, came in very handy during our long days sightseeing and exploring Prague. We stayed in a suite with a separate bedroom and living area, which is a nice option to have when traveling with kids. Anyone who has ever traveled with a baby or toddler knows that sharing a cramped hotel room isn’t ideal. The extra space of the suite allowed us to stay up passed our daughters 8:00 pm bedtime and enjoy a few beers hours of relaxation without having to attend to a demanding, tiny human. The decor had an old world, romantic feel, much like the city of Prague itself. Elegant draperies, stained glass, intricate artwork, and an elaborately adorned ceiling added to the ambiance of the hotel. The room was equipped with thick blackout curtains, which were appreciated during our daughter’s midday nap. The location of Hotel U Pava is the best part. 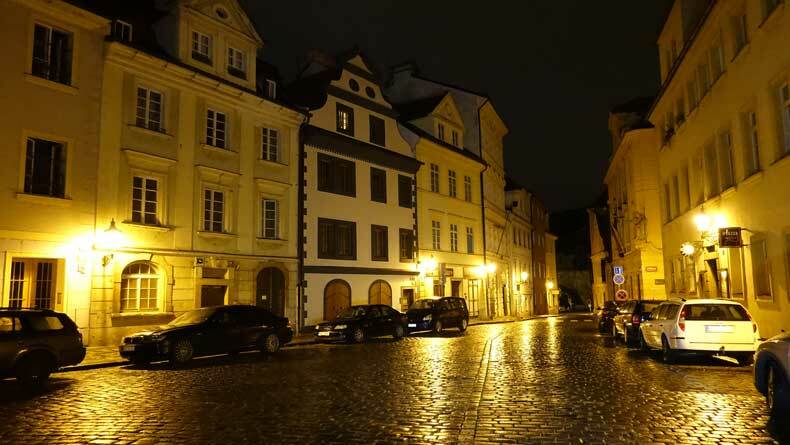 It’s situated on a surprisingly quiet square in the center of the Malá Strana area of Prague. I truly don’t think there is a better located hotel in all of Prague. It was quiet and intimate, yet just a short walk from the hustle and bustle of the tourist sites. I would definitely recommend staying on the Malá Strana side of the Charles Bridge. This was something I debated before finally choosing a hotel. I am so glad I chose the hotel and the location I did! We were situated perfectly between Prague Castle and Old Town, in walking distance to everything, and yet still in an area relatively easy to get to by car. The quiet street in front of Hotel U Pava. The one downfall, if there is one, would be the limited parking available. There were a few spots right in front of the hotel, and a few spots where you could parallel park around the square. While we didn’t have an issue parking, I could see where it could potentially be a headache when the hotel is fully occupied. We would definitely stay at Hotel U Pava again and probably will someday. We fell in love with Prague and would love to return to experience even more of the city. When we do, lodging is one less thing I’ll have to research. 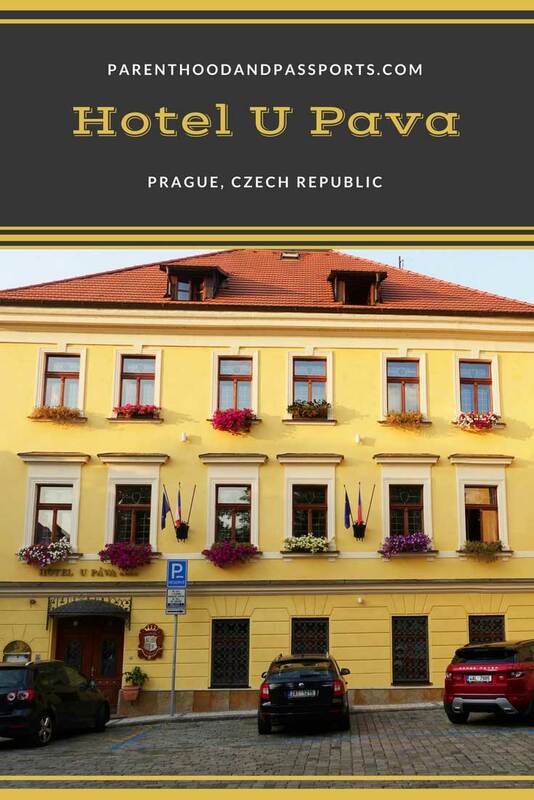 Have a question or comment about where to stay in Prague, Czech Republic, or about Hotel U Pava? We’d love to hear from you. Leave your thoughts in the comments below. Prague is one of my favorite cities. I only stayed at an airbnb there would love to try this! Hotel U Pava looks like the perfect hotel to stay in, in Prague. Location is very important and the fact its inbetween the old town and castle makes the location perfect for everything! I usually travel Europe by bus so parking isn’t important for me. 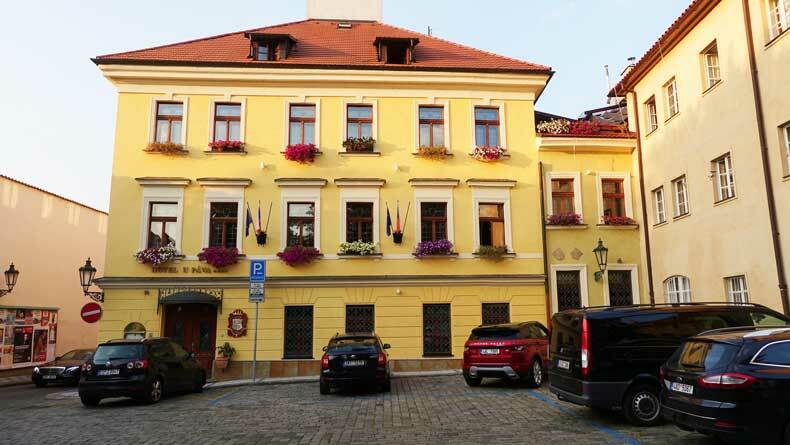 Hotel U Pava looks like a traditional Czech building with traditional interiors. Also located near Charles Bridge which is very tempting because we can walk down to nearest tourist positions. Lovely shots of hotel and detailed description. This is actually a decent sized hotel for Prague! I love hotels that are located in the middle of the action. Nothing is like walking in a new city, the cabs and Uber get old really fast. U Páva sounds like a great hotel. And good on you for highlighting the hardworking staff. Though I’m sorry you didn’t get a photo with them, I’d have wanted to salute them. I know! I should have! I thought about that after we left. Hotel U Pava looks like a great accommodation option in Prague. I loved the interior and also the location. I love hotels which are location off the radar as chaos is what I dislike the most. Great hotel and an even better location. Though I wonder how hard it’ll be to find if I’m walking around the city looking for men peeing! I did find it frustrating the lack of public facilities in Prague. I agree! We walked around forever looking for a public restroom. Maybe that’s why they built a statue of two men peeing on the street! Haha!